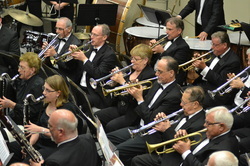 The Memorial Concert Band of Colonie is sponsored by the Parks and Recreation Department of the Town of Colonie (New York). The Colonie Town Band and Centennial Brass Choir are also sponsored by the Town of Colonie. The Colonie Central School District provides rehearsal and performance space for the Memorial Band through the Music Department.